(Phys.org)—A team of researchers from several institutions in Japan has conducted experiments with results that indicate that silicon is likely the missing element in Earth's core. The group gave a presentation outlining their findings at a recent meeting of the American Geophysical Union. Earth scientists have concluded that approximately 85 percent of the Earth's core is made of iron while nickel makes up an additional 10 percent—but the final 5 percent has been a bit of a mystery. In this new effort, the researchers conducted lab experiments that gave results suggesting that the final ingredient is silicon. To figure out which elements exist in the Earth's core, researchers have been building virtual Earths in labs and then subjecting them to real-life conditions such as heat and pressure. For now, this is the only approach possible because the core is far too deep to dig a hole and send a probe down—it is approximately 3,000 km below the surface and is a relatively small target—about the size of Pluto. Experiments have consisted of building cores containing different materials, subjecting them to heat and pressure and then sending seismic waves through them to compare with real ones sent through the real core. Silicon has been considered as a possibility before due to the ease with which it bonds with metals, but it had not been thoroughly tested. 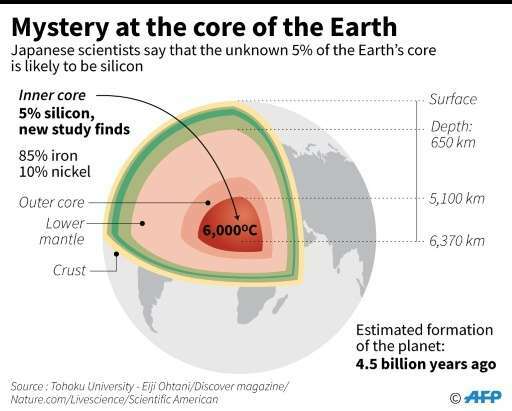 The researchers in Japan heated their iron, nickel and silicon core to 6,000C° and applied pressure 3.6 million times that at the surface of the planet. Seismic analysis indicated the mixture they had created matched that at the real Earth's core, strongly suggesting they had found the missing element. As the researchers note, understanding the true makeup of our planet, including its core, may help to better understand its history. 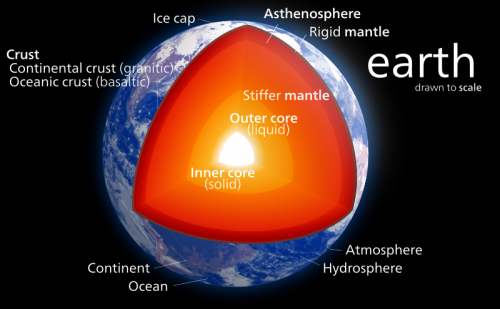 Learning about the materials that make up the core today offers a way to learn more about what the interior parts of the planet may have been like billions of years ago, such as when the core separated from rockier material around it. The results of the new effort also suggest that oxygen is likely not very abundant in the core, which some in the field have suggested was a real possibility. The light elements in the core could constrain the conditions of accretion, subsequent magma ocean, and core formation stages of the Earth. There are several studies for sound velocity measurements of the iron-light elements alloys. However, the measurements are not enough to constrain the light element abundance in the core tightly at present due to inter-laboratory inconsistencies using different methods which are originated from the difficulties to make such measurements under the extreme conditions. We measured the sound velocity of iron alloy compounds at high pressure and temperature relevant to the Earth's core using double-sided laser heating of a DAC combined with inelastic X-ray scattering at SPring-8. We measured the compressional velocity of hcp-Fe up to 166 GPa and 3000 K, and derived a clear temperature dependence of the Birch's law for hcp-Fe. We measured the compressional velocity of Fe0.89Si0.11 alloy and Fe3C at high pressure and temperature, and we could not detect temperature dependency in Birch's law in these compounds. Additionally, we measured the sound velocity of Fe3S, Fe0.83Ni0.09Si0.08 alloy, and FeH at high pressure. Combining our new data set which showed remarkable differences from previous data on the sound velocity, we present a model of the chemical structure of the inner core. The outer core composition was also estimated based on partitioning behaviors of these light elements between solid and liquid iron alloys under the core conditions. So the picture we build up is a liquid outer core with a (relatively- a few percent) high oxygen content and a low (less than 1%) silicon content, and a solid inner core with a small (less than 1%) oxygen content and a (again, relatively- a few percent) high silicon content. Good research and food for thought. I wonder what percentage of other metals are in the core such as uranium, lead and all the rest. I find it really hard to believe it would be just nickel and iron.